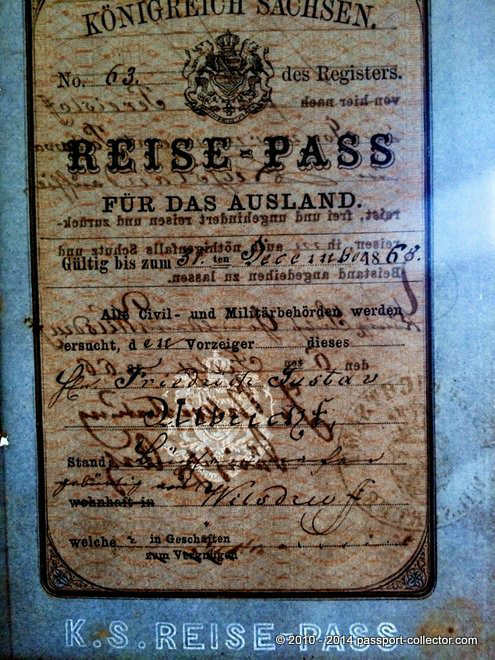 This 1866 passport from the Kingdom of Saxony, Germany I just got recently. A very unusual type and very different to the standard type. 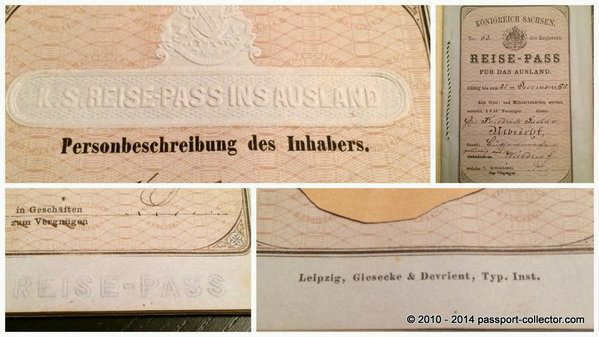 Besides the early Wander books which was at the same time a passport it’s possible that Germany was one or THE country which issued passport booklets so early. But look at the “security features”! Color thread binding – sealed, Micro printing, Coat of Arms watermark, blind stamp and embossed letters! As you can see a early master work from Giesecke & Devrient, Leipzig. Indeed the finest example of security features of any 19th century passport! Founded in 1852 by Hermann Giesecke and Alphonse Devrient, the firm initially specialized in high-quality printing, notably currency and securities printing. From the 1850s to the 1870s the firm printed some of the important biblical editions of Constantin von Tischendorf. The partnership’s reputation for quality work was confirmed at the 1867 international exhibition in Paris. Giesecke+Devrient supplied currency during the inflation in the Weimar Republic in the 1920s, one of the most prominent cases of hyperinflation. It also printed tickets to the 1936 Olympics in Germany and did business with Spain under Franco Its role in facilitating the destruction of the economy of Zimbabwe through another printers’ breeding of hyperinflation under Mugabe is well-known.